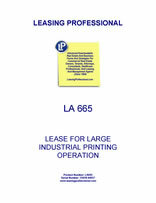 This industrial lease is designed for a tenant who is a commercial printer, and contains renewal option(s). There are detailed provisions relating to environmental matters, as is common in industrial leases such as this. This agreement of lease ("Lease") is made between Commercial Property Landlord ("Landlord") and Acceptable Tenant Inc. ("Tenant"), who leases form Landlord the property described on Exhibit A (the "Leased Premises"), attached hereto and made a part hereof. 1.1 Term. This Lease is for a term of five (5) years beginning on _____________, and ending at midnight on _______________ . 1.2 Option to Extend. Tenant, provided it is not in default, has the right to extend the initial term of this Lease for two extension periods, each extension for a period of three years. To exercise its option to extend, Tenant must notify Landlord in writing 180 days prior to the end of the lease term then in effect. If Tenant fails to so notify, Landlord may lease the existing premises to another party. 2.1 Rent. Tenant shall pay as rent the sum of $___________ per month, plus all additional payments as required herein. The first payment of rent shall be due ________, and subsequent payments shall be due on the first day of each succeeding month. If possession is tendered to the Tenant during a calendar month, rent for the partial month shall be due on a pro rata basis. If any rent is not paid promptly when due, Tenant shall pay interest on the unpaid rent at the rate of 15% percent per annum. All rental payments shall be mailed to Landlord at: ________________________. Landlord may from time to time designate other places for the payment of the rent by written notice to Tenant. 2.2 Rent on Options. If Tenant exercises its right to extend the initial term of this Lease, monthly rental for the first three-year extension period shall be $____________ per month due on the first day of each month. If Tenant exercises the second three-year extension period, monthly rental shall be $_________ per month due on the first day of each month. 3.1 Purposes. The Leased Premises are to be used only for printing, document preparation and storage, form preparation and related uses, and for no other purpose. Tenant agrees that business will be conducted actively on the Leased Premises. 3.2 Conformance to Law. Tenant shall be responsible for obtaining all licenses and permits necessary for its use and occupancy of the Leased Premises and Tenant shall comply, at its own cost and expense, with all laws now existing or hereafter enacted, including but not limited to all sanitary and environmental laws and ordinances; with all rules and requirements pertaining to health, fire and safety; and with all other state, county and municipal requirements affecting the use, operation and cleanliness of the Leased Premises; provided, however, Tenant shall not be required to undertake environmental remediation work resulting form a condition of the Leased Premises existing prior to the effective date of this Agreement. Tenant shall comply with all rules and regulations of any local Board, of any authorized organization of fire underwriters and of any state authorities relating to safeguarding against fires, and shall in every other regard use the occupy the Leased Premises in accordance with all applicable rules and regulations of the state, county and municipal government authorities. Tenant will not use the Leased Premises for any purpose that is unlawful or that tends to injure or depreciates the Leased Premises. Tenant will indemnify Landlord and hold Landlord harmless from all damages, penalties, and forfeitures imposed by reason of any violation of law committed by Tenant, its agents and invitees, or from Tenant's failure to obtain the necessary licenses and permits for operation. Tenant will not allow any nuisance to exist on the Leased Premises, and will abate any nuisance promptly without expense to Landlord.